Over 350 industry professionals attended the Gala at the Artscape Wychwood Barns on October 21st, 2010! We would like to thank our many generous sponsors for this successful first ever Gala: TELUS, Altus Group, Lafarge, TD Bank, Hanson, Stikeman Elliott LLP, Sun Project, The Dalton Company Ltd., ReNew Canada, BLJC, George Brown College School of Continuing Education, John Hazen Sound Designs, Nomad Designs, Steam Whistle and Carbonzero and the Toronto and Region Conservation Authority for their support of our first Greater Toronto Chapter Recognition Award. 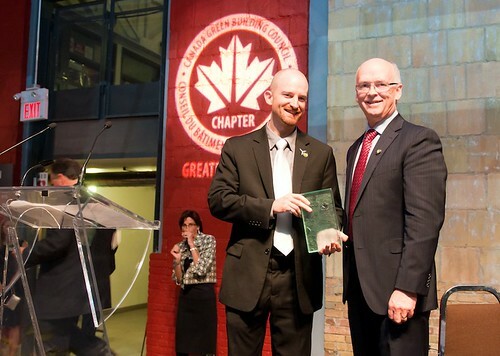 Congratulations also to Derek Satnik, winner of our first Greater Toronto Chapter Recognition Award. We would like to extend a big thank you to all Gala attendees. Your attendance and support helped make the Gala a tremendous success.